I was going to wait to update until I left here in a couple of hours to take care of a couple errands before going to my dad's for dinner, but I just finished East, West and am sitting down to write my commentary on it, so why not distract myself for a minute with updating my progress! I also took a look at Jane Eyre. I have 33 more pages to read in that than I thought, so it takes up a bit more of the chart than it did before. 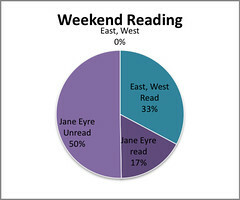 The part that I have read of Jane Eyre is actually just last week's reading. I didn't finish the assigned portion of the book for last week, so I'm including the whole book now, minus what I did last weekend. Since I don't have too many other things to be doing tomorrow that I can't put off until Monday, I think that I'll be able to handle the Jane Eyre reading. Also, I don't really have to have that done until Tuesday, so if I get most of it done by mid-day tomorrow I'll be pretty happy. I have to admit that I'm really liking this pie chart thing, I can definitely see my progress better than just keeping track of it in my head. Now onto writing over-due responses!